Since we’re on stoves this week, here’s one that I’ve been meaning to showcase for a while: The 39″ wide, two-oven Kenmore Elite range from Sears. Today, it’s priced at about $1,900 for gas, $1,800 for electric. That’s alotta dough, but not so much as the lovely Big Chills. And this stove has that nice, wide, retro stance. While I love vintage, I have to say there is one big thing that I do miss: A self-cleaning oven. This Kenmore, with its stainless steel finish, suits a retro renovation kitchen well. Pair it if you can with a “fitted” 24″ deep stainless steel fridge … edge your countertops with stainless steel… and go in any direction that you please with the cabinets, it would work out just fine, I think. Online at Sears. 2014 Update: I am now quite wary of this stove because a reader reported that after just a few years in use the stove needed a part and the part was discontinued, making the stove un-repairable. I tried to connect with Sears PR twice via email to confirm this, but never received a response. So I am now wary — if you are interested in this stove, best to talk to Sears directly so that you can get to the bottom of the story. 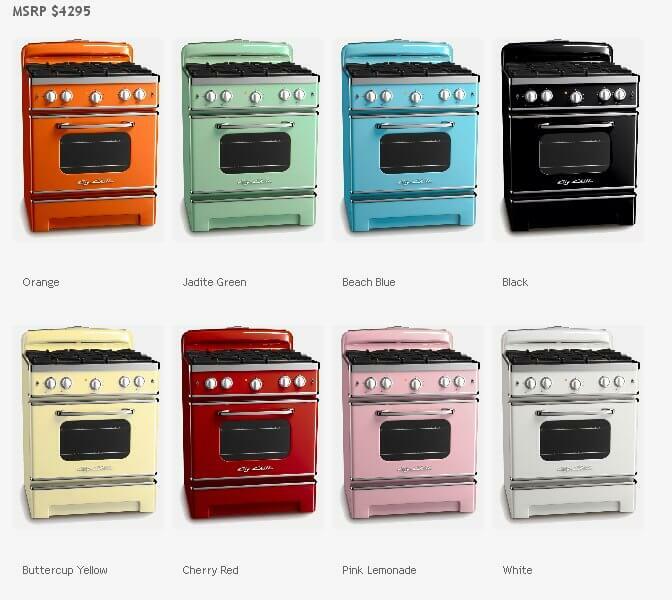 I almost bought a used version of this stove recently. Apparently it is a control board that goes out on all of these babies. The good news is that the Sears stove is made by Frigidaire. When I called Sears they said they could not get the part. However, if you get the part number and research it online, you will see it is still available. I was disappointed that Sears made figure that out. The control panel had just been successfully replaced on this range, but we ended up not buying it for condition issues.